Posted: Tuesday, September 5, 2017. 1:59 pm CST. 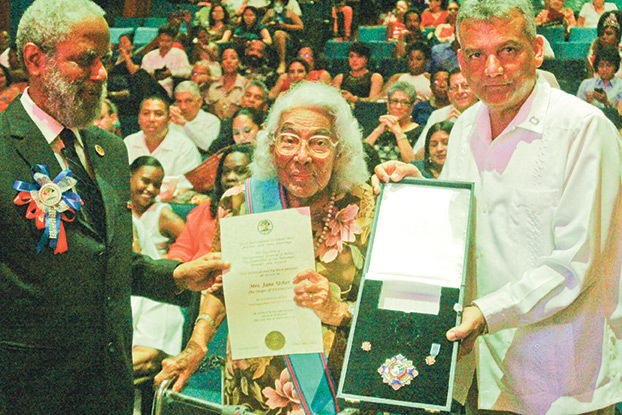 By BBN Staff: Today, iconic Belizean Dr. Jane Usher celebrates her 100th birthday. Born on September 5, 1917 as Jane Ellen Mary Price, Dr. Usher is the sister of Rt. Hon. George Cadle Price, the nation’s father, and has similarly dedicated her own life to serving Belize. During her illustrious career, Dr. Usher served as the elected area representative for the Pickstock electoral division from 1979-1989. She was the Minister of Health and Cooperatives in the PUP Cabinet between 1979 and 1984, and was also as a member of the Opposition in the House of Representatives between 1984 and 1989. She also served as the President of the Senate from 1989-1993. Dr. Usher, the Director Emeritus at the the Holy Redeemer Credit Union (HRCU) since 1944 and also served as the organization’s Chief Executive Officer. Usher holds the title of longest running CEO in Belize. In 1992 she was appointed by Queen Elizabeth II, Commander of the British Empire (CBE). In 2000 she received the Paul Harris Award from the Rotary Club of Belize. In 2013, Galen University Awarded her an honorary doctorate, and in 2016 HelpAge Belize threw a gala in her honor, saluting her many achievements. BBN understands that Dr. Usher is still diligently at work at this current moment even.